The above info came from A Lee, and was edited by yours truly (contact me). The image came from Amazon.com. Arc the Lad is a story full of action, adventure, mystery, tragedy, and hints of romance with a big healthy dollop of fantasy to cover it all up. 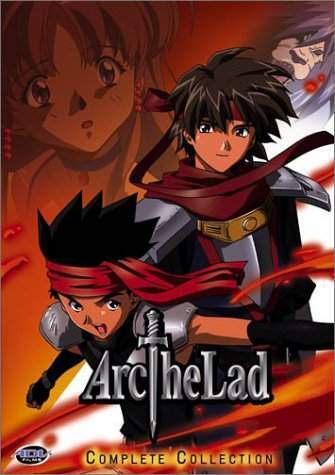 Despite the name of the show, Arc the Lad is actually all about a young bounty hunter named Elk. Blessed by the spirit of fire, he can produce flames at his will. When a blimp is taken over, Elk and Cougar (another hunter) take on the mission to rescue the hostages. While doing so, Elk encounters a strange girl and her monster, Hunter. It seems that there are mysterious men in black hunting for her, but she manages to escape. Later Elk encounters the girl again, who goes by the name of Lieza. There is a bounty on her head, but Elk refuses to bring her in for the reward. It appears that Elk and Lieza have something in common: they both have something to do with the five spirits. Elk just wants revenge for the murder of his family, and Lieza just wants to go home, but together they are thrust (albiet unwillingly on Lieza's part) into a world of danger, political plots, corruption, and conspiracies. The above description came from A Lee, and was edited by yours truly (contact me).